I then upgraded to a Dell perc6i – I’ve had some experience with those and they’ve always been solid. Again, if you have over 1 TB disks and need a RAID10 buy the H700 instead now! NOTE: For RAID levels 0, 1, 5, and 6 only, you can use part of the available disk space to create one virtual disk and then use the rest of the disk space to create another virtual disk or disks. 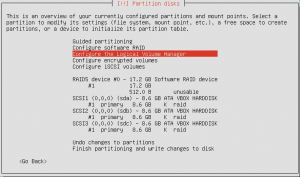 I wanted my disks in RAID10 – they are 2 TB SATA disks. 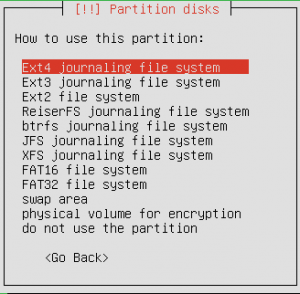 Great but when you make the RAID volume (virtual disk) it creates a 4 TB (give or take) virtual disk – that’s all you get, you can’t customize how many virtual disks you have or their sizes, you get 1 at 3.9x TB. Great however, if you’re putting Windows on it IT WON’T WORK! Why? Because you have to put your boot volume on this 4 TB disk but Windows only lets you have a boot volume for Windows on a maximum 2 TB disk / volume. The rest of the space is all wasted and I don’t think you can use diskpart to fudge it either, it errors out. 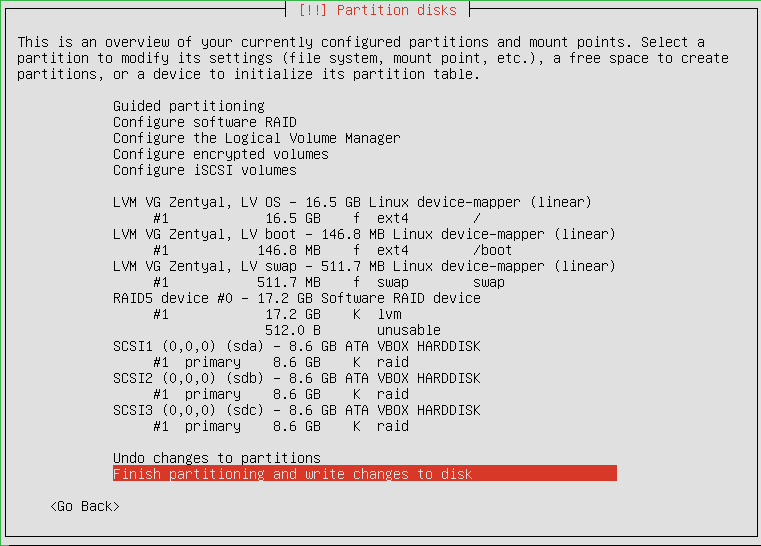 You can do everything you want to do if you use RAID5 but I want to use RAID10 you’re out of luck. The solution is to upgrade your controller to the H700 which can indeed allow you to make 1 – RAID10 container with quantity 4, 2 TB disks for a total RAID10 container of 4 TB THEN THEN THEN you can create virtual disks in that container of say 120 GB for your OS boot volume and have another separate virtual disk with the rest of the space for your data volume. There’s another “problem” that I also bumped into online and that would be the use of disks OVER 2 TB (or maybe it was 3 TB). That has to do with what the firmware can handle from a bit level – a 32 bit firmware can only handle 2 TB of storage where a 64 bit firmware can handle far more than that SO if you have 3 TB disks…I’m not sure the H700 will work for you, you’d want to make sure from Dell your controller can handle the size disk you’re using. I don’t have specifics on that but I’m aware of this other problem. I did find another blog online that tipped me off to this but he was using RAID5 so he fixed his problem by redoing his virtual disk setup. His “fix” wasn’t really a fix for me but it turned the light bulb on in my head. That blog is the first in my references list. I had this unusual (or what I thought at the time was unusual) error when using on board Intel RAID for 4 SATA disks. I wanted a RAID10 config for a server build but when I configured RAID10, had all 4 disks in great shape, booted to Windows Server (doesn’t matter which version I don’t think – 2008 +) it gave me the oddest error! Looking at the Intel BIOS I noticed it said “bootable no” thus, I now understood why the OS was complaining. It turns out I misconfigured my RAID setup from the start. What you need to do is configure an OS volume and a data volume. I wanted my OS volume to be something sane anyway so I created a volume of 120 GB and the rest of the 3.x TB as another RAID volume. As soon as I created a boot volume that made sense (the 120 GB) the Intel RAID software flagged it with a “bootable yes”. SUCCESS! You can now install Windows Server 2008 + on the RAID volume. That will allow clients to “browse” the network and “find” your server and the shares it is offering to hosts / clients. 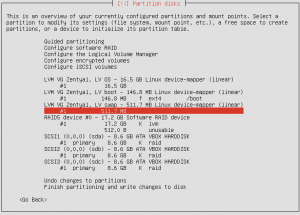 I looked around for a decent installation guide for installing Zentyal in a software RAID. Even the Zentyal WIKI didn’t show much love. This is perhaps the most thorough how to install Zentual in a software RAID online to date (Feburary 23rd, 2013). I went through this before but with CentOS but that’s pretty well documented online. CentOS’s manual installer with LVM is a bit different but similar enough that using the Zentyal wizard brought back the memories. It has been a LONG time since I did it and I never did put it into production because I didn’t trust the install even though looking back it probably was a solid setup. That setup was slightly different anyway since it used a mix of hardware RAID1 and Software RAID1 to essentially give me RAID 10 (I think…) but with slightly less performance than an actual RAID10. I mirrored the physical disks then mirrored them with software on top of that. Maybe a new name could be Ghetto RAID? It would have been confusing I’m sure if a disk did go bad probably so I shy’d away from using it in the end. That system was for myself anyway not for anyone I was doing work for. More on RAID here as I’m sure you want to be enlightened. Lets get started, mostly images here with little comment. I assume you know how to boot up into the installer. If not we’re in trouble! I like using an app to install it on a pen drive and I boot to that since the system I had didn’t have a CD-Rom or DVD drive. Choose a password for the new user: Complex one hopefully! Re-enter password to verify: Retype what you just type in! 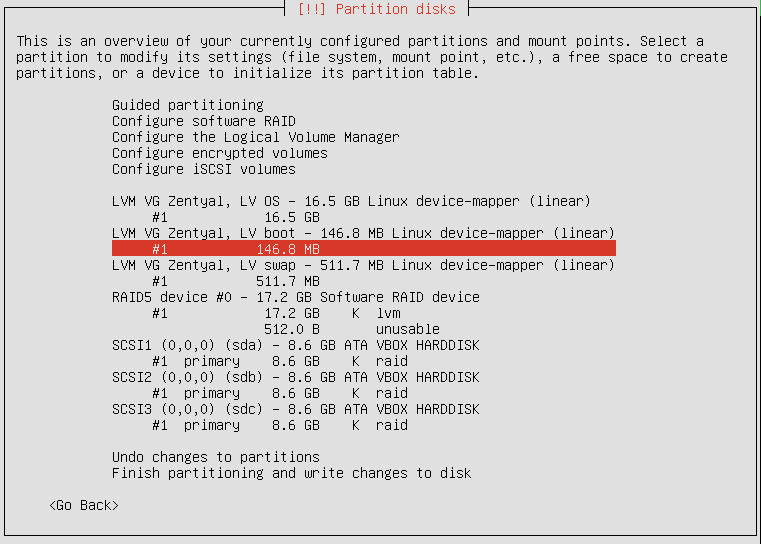 Here you DO need to select your physical disk and prep it so you can set it up via the software RAID. If you don’t, it just won’t work. 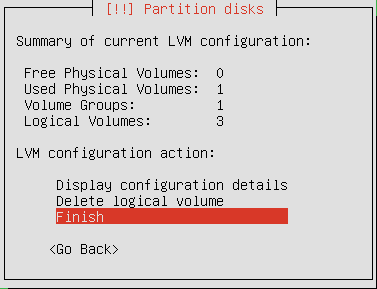 You have to do this for each disk you want in the RAID setup. In my example, I run through it on all 3 disks so keep that in mind as you walk through the tutorial. It might be redundant but for real noobs or someone looking for a thorough tutorial they’ll appreciate it because the screen results do change. SCSI# with “FREE SPACE” like the above pic on it. So I should have a pic on it with all 3 of my disks with “FREE SPACE” of 8.6 GB but I’m missing that. 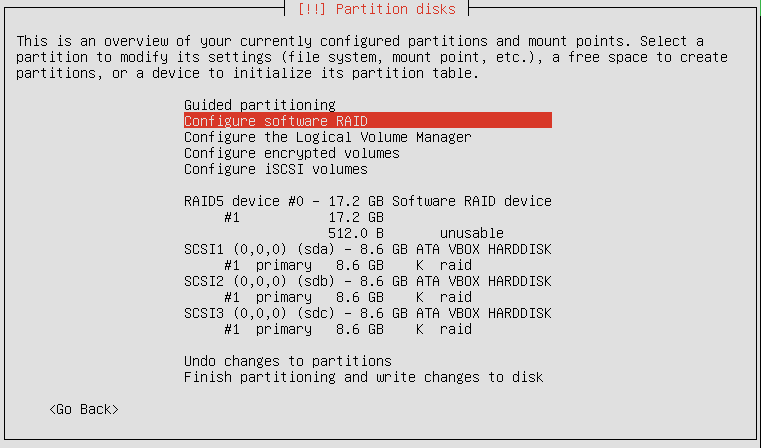 I’m ALSO missing the screen shot where we go up in the list after all the disks are prepped and then we select “Configure Software RAID” which then takes you to the screen shot below! I guess I’m just not that good! 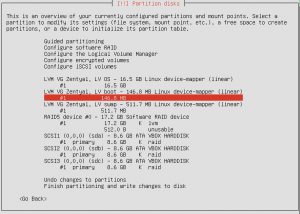 Hopefully here you understand which software RAID setup you want – in my example I use RAID5 in my VirtualBox setup just for the tutorial. If you wanted RAID10 you’d be doing the work on all 4 or more disks that you have. This is a pretty cool feature actually, a lot of hardware RAID setups let you use a “spare” disk, it’s a hot spare…spinning and running. If you lose a disk one of the spares will take over as though you slapped it in and replaced a disk. You can then replace the broken disk. I’m not sure what happens in this scenario with the software RAID setup. Does the new disk become the spare? Probably but you might want to test that theory out! 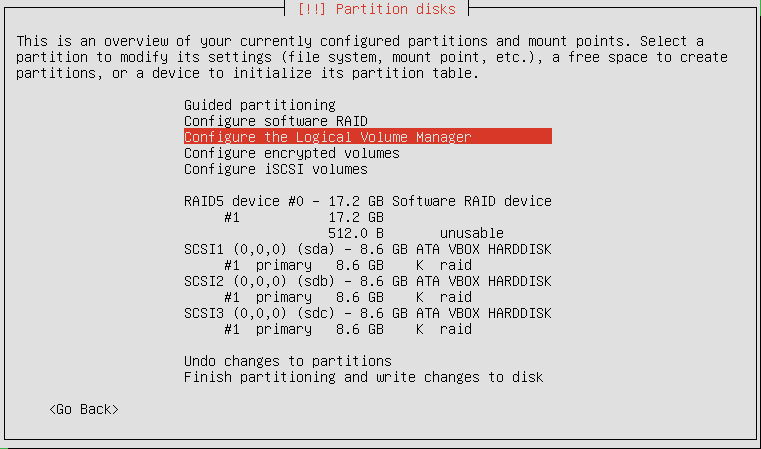 Here, even though I have “Configure software RAID” selected, it’s not what you should do. This just shows the new “RAID5 device” we made. I could probably carve that out but I left it for posterity. 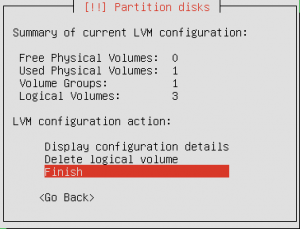 Now that we made out “disk” essentially, we bundled 3 disks into 1 disk (RAID5 device #0) we have to make logical volumes we can partition which will then hold the data. Think of it as this point as all we have now is a blank hard drive. 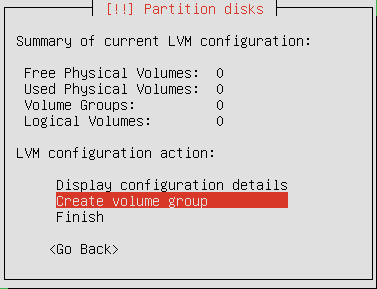 The “Volume Group” we’re going to make (and you can name it whatever you want I just named it Zentyal) will house the volumes / partitions where our data will live. At this point we’ve got 1 physical volume (a disk) and 1 group, I like to think of that as basically the same thing even though it probably isn’t. 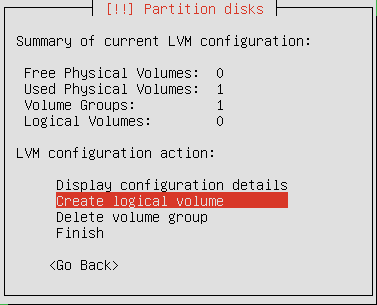 What we’re going to do now is partition the Volume Group (disk imo) and partition it. In linux you typically see /boot, /usr, /tmp, /home, and others. For Zentyal you will be out of luck booting the system without making a /boot volume and a “/” root volume. Those are the two minimums I’ve found from experience! The first time I muddled through this I didn’t have a /boot volume and the system wouldn’t boot! 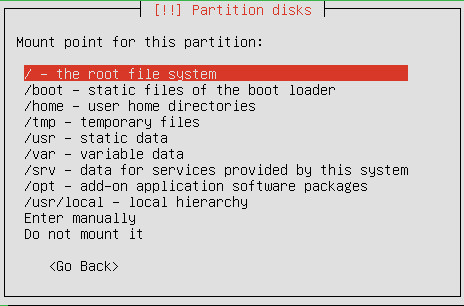 Now that we’ve partitioned out the disk we have to go into each partition and tell it what we want it to be. 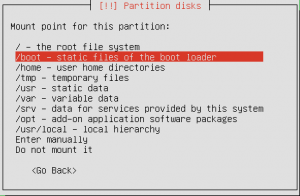 In my example all I do is partition the volume in 3 sections, /boot, /swap, and “/” or root. If you care to you can do the other volumes noted in the Ubuntu tutorials on other sites including the official Ubuntu document page BUT I find it much easier for most of the installs I do to simply have the afore mentioned 3 partitions. 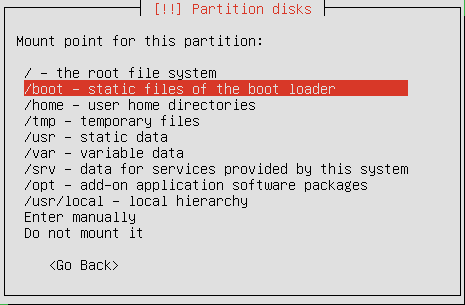 Notice here how we now have: Out “OS” <- An arbitrary name I used, it’s actually “/”, also swap and boot. Now…there are a few more screens I don’t think it necessary to document like are you using a proxy, blah blah blah. If you got this far just click ok or next next next. When it asks if you want to install the GRUB boot loader – ahhhhhhhh YEAH! That’s it. You’ve now installed Zentyal in a software RAID5 (of if you chose a different one then you’ve installed that too) configuration. Results once Zentyal finally boots up, you choose your install options, etc, etc, etc. Just a quick note about error 0x80070002 if you’re using server 2012 when trying to access a DFS share. My clients configuration is currently this, we’re working through a few “quirks” that have cropped up when rolling this out. For the most part things have gone well but if you can’t access your shares you’re in trouble. It wasn’t every client either, just one in particular and I didn’t want this to spread. I also saw some slow downs on a few other clients so maybe this issue was going to creep. Not good! Their server setup was – 2 Windows Server 2003 Servers doing DNS, AD (we moved DNS, AD and file shares to the new 2012 servers). 2 Windows Server 2012 servers now doing DNS, AD, DFSr and file sharing. So for their purposes one server was at location A and the other at location B. This allowed them to have the same “shared drives” at each location. You simply adjust the logon script for said user at location A or B to point to their locations local server and DFS shared folder. One particular client was getting this error though: “Windows cannont access \\server1\dfsfolder\sharedfolder” Error code: 0x80004005 Unspecified error. What I figured out (and this must be some kind of DNS error / issue because we’re no longer using WINS) is you have to use the FQDN (Fully Qualified Domain Name) for this to work. Working on a project for stuff I personally own and manage (VMWare Servers and various guest OS’s) I had to convert machines using VMWare Stand Alone Converter. A quick note about that – if you’re converting Linux Machines that have the “root” account disabled by default like Ubuntu has then you need to log into your Ubuntu target and make the root account able to login via the console and ssh. Now you can use those credentials in VMWare converter to migrate your machine from one server to another! Also note, when doing this you’ll need to adjust your NIC since it won’t get an IP address (see the post before this one). * Note – you should be logged in as root to run this command! Then “exit” and log out. Try logging in as root now – you shouldn’t be able to but you can sudo to still elevate your non privileged user to root privileges.